Wedge prism is an optical element with plane-inclined surfaces; usually one face is inclined toward the other at a very small angle. It deflects light toward its thicker portion. It can be used individually to deflect a beam to a special angle. Two wedge prism works together can assembly an anamorphic prism to correct the elliptical shape of laser beam . 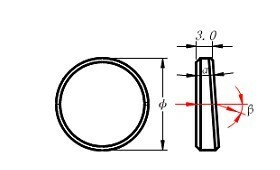 The wedge prism is ideal for laser beam steering applications.By combining two wedge prisms which can be rotate individually,we can direct the input beam to any where within the cone angle B, where B is 4x the specified angular deviation of one wedge. We can make deviation angle from 1deg to 10deg. Other angle can be realized upon request. * Design wavelength is 632.8nm. 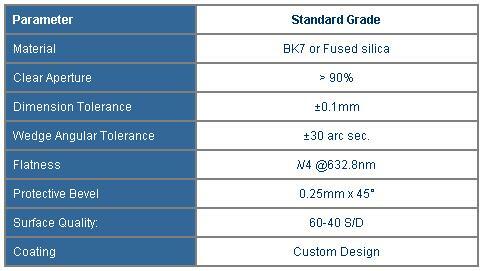 * Other sizes and coatings are available upon requirements. Copyright @ 2003-2004 by Facimton Optical Technology Inc. All Rights Reserved.